With the highly accurate milliohm-meter C.A 6240, a poor contact line between two measure points can immediately be detected. Measurements with the milliohm-meter C.A 6240 are accurate and reliable since the test power achieves levels of up to 10 A. The possibility to store data and transfer it to a PC allows a long-term storage, so that the development of resistances can be recorded, which makes the highly accurate milliohm-meter C.A 6240 a necessary equipment for maintenance. The highly accurate milliohm-meter C.A 6240 is applicable for all measurements concerning electric resistances, inductive construction parts etc. Thus, it provides the user with a high ergonomics level due to the automatic functions for measurements. The large liquid crystal display with 2 digital displays provides a high meter-reading comfort and a lot of further information, thus ensuring an optimised device-handling as well as reliable interpretation of the measuring data. With a rotary control the user can switch between 6 measuring ranges: from 5 µΩ to 400 µΩ. 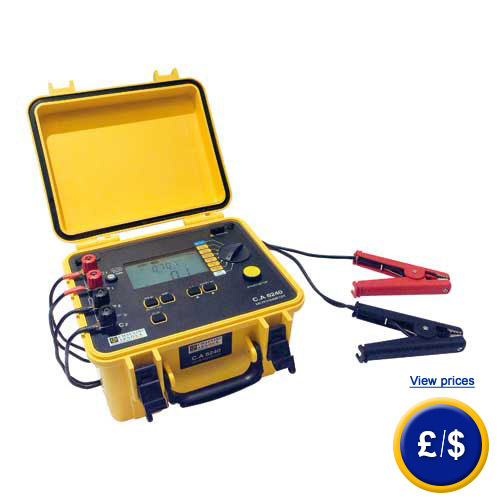 Every measuring range has an attributed power level: from 10 A (most sensitive range) to 10 mA (400W range). For further information about milliohm-meter please read the following technical data or use our hotline: UK customers +44(0) 23 809 870 30 / US customers +1-410-387-7703. Our engineers and technicians will gladly advise you regarding the highly accurate milliohm-meter C.A 6240 or any product in terms of regulation and control or scales and balances of PCE Instruments. - Calibration in laboratory and certification according to ISO (at first purchase or for recalibration, e.g.